I was wondering if anyone has information on meerschaum. I know that it is used for pipes and I have seen some of the beautiful work done. Can anyone give me some advice for carving it as I just aquired a piece. I have heard the recommendation of carving it wet. And I know that it is generally treated with hot carnuba wax when finished. I haven't carved it myself, but I've recently been interested in getting some to try out. Here is a quick description of the process from the Altinok Pipes site-- this refers to carving a pipe but it would be the same for anything else. Meerschaum needs final treatment with bee's wax. Altinok sells what they call "special" beewax, but it's probably no different from the grade sold by Studio Products in pastilles rather than as a solid block. Before starting carving your meer, allow it to dampen for a while by putting it into water. After about 1 hour time, it softens sufficiently to get ready for an easy carving. Keep your dampened raw meerschaum block in a nylon pouch between the carving periods or when not in use to avoid it to dry again. Just for your information, our carvers mostly use their knife's very thin and sharp point for carving. But, of course, it is up to you. After carving, allow the pipe to dry and then dip in wax to finish. You need to use a special wax for this. 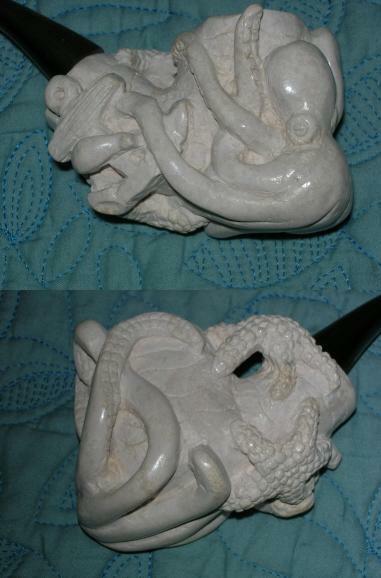 I carved a Meerschaum pipe from a "Meerschaum Pipe Kit" that my brother gave me for a Christmas present. The result is shown below. I did the work about thrity years ago and never did smoke it. I stopped smoking in the mid-eighies. If I remember correctly, I soaked the meershaum in water first and, between carving sessions, kept it wrapped in a wet paper towel and placed in a Zip Lock plastic bag . I used small plam chisels that my wife ( a professional artist) recommended I buy. If the project dries out while it is being carved, it can be soaked again for additional work. Once the beeswax is applied, I don't think it can be soaked again. Since this was a kit, the bowl and stem holes were already drilled and the bit was included. The kit also included a small test block of meerschaum that I carved and made into a necklace for my wife. Meerschaum has a hardness of about 2 and holds nice detail. I was even carved one star fish stretched from the stem to the bowl without any disaster. The picture of the left side of the pipe shows this. A meershaum pipe darkens with use. It turns from white to yellow and then golden brown. I believe that extremeties of the carving darken first. This characteristic is often considered when designing a pipe. What is Meerschaum? I've heard if it for decades, but never knew what the material really is. According to my sweetie (she works in a gem and mineral shop), it's an actual mineral. But she isn't sure of the composition. I'm pretty sure the Altinok Pipes site has a pictorial about how it's mined. Far as I know it's impossible to get meerschaum in completely unprocessed form. The Turkish government will not allow its export. You can buy the pre-drilled pipe kits, but not undrilled blocks. There is a "pressed" form of meerschaum you can buy in blocks but I don't know anything about its working qualities compared to the naturally formed material. Link to supplier of American meerschaum. Going back a few months to the subject of meerschaum I can add some information. Meerschaum (sea foam in german) is the hydrous magnesium silicate mineral sepiolite. It occurs in massive deposits in Turkey, there are some deposits in North Carolina . It is probably a precipitate from sea water. The origin of magnesium minerals from sea water is (was) not well understood as there was no source for the hugh quantities of magnesium needed. The main use is for smoking pipes. Well known are the large carved meerschaum pipes of Austria and Germany. Sherlock himself smoked one, a gourd with a deep curve or neck and the bowl neatly sitting in a carved out opening in the gourd.I have made a few pipes of meerschaum with techniques similar to those mentioned by other carvers. One extra step I read about mentioned soaking the pipe in milk before the wax treatment. What it did is beyond me but the action of heat from smoking and the tobacco will color the pipe golden yellow to a rich brown and even a burned color. I ran one piece through a kiln at 2000 degrees F and then triedcarving it. It was probably a lilttle softer but friable as the heat drove off the chemically bound water and left a rather open structure. The color was a putrid white. As for carving I used a Dremel tool. All of this is excellent info, except the part about Holmes' choice of pipe. The use of a meerschaum calabash in movies and illustrations is totally incorrect for the character. Aside from the references to him using a briar pipe that show up in at least one of the stories, there is his choice of tobacco. A man who smokes a VERY harsh black Turkish tobacco is unlikely to smoke a pipe renowned for it's effect of cooling and mellowing the flavor of tobacco. He paid good money for the vicious bite and flavor and wouldn't want to miss one throat searing bit of it. If he was like myself a lover of a mild sweet Cavendish, the calabash would be plausible. Disregard this post if the geekiness is too intense. Asbestos is also an impure form of Magnesium Silicate--that is not to say that Meershaum is Asbestos. It isn't. It probably shares a number of charachteristics with Asbestos--including high heat resistance. Big PS--Although I'm rather unlikely to marry and have children at the ripe old age of 52; if I should sire any chlidren; my Doctor says that due to all the years that I spent working with Asbestos--and other toxic substances--my children, in all likelyhood, would be born Naked! Thanks for the offer but I have two pieces that have been around now for over 30 years. Meerschaum is a nice medium for carving , treat it like you would if carving a pipe. Make sure you treat it with wax after carving for that special luster. A suggestion -see what someone like Janel could do with it on a lathe-might dull the tools a bit. As for asbestos-it has a completely different mineralogical structure than meerschaum. Asbestos is fibrous as are many related minerals. As a caveat do not eat the meerschaum, stuff it anywhere in your body, breathe the dust from turning or carving or send it to the EPA. Given all the cautions, I think that I would not attempt to turn Meershaum in my studio. I have learned enough about turning so far to know that it is a very dust-producing activity. That concern aside, turning the material could be interesting, but the likelihood of spreading the dust around the studio will keep me very cautious about using it. With regard to carving meerschaum, I have a leaflet from Laxey Pipes in the Isle of Man . Quote " Soak the block in water for 30 minutes.This will cause the block to darken in colour. Allow to dry nauurally for 24 hours or until it shows a little white again. This is the drying white stage- the ideal condition for successful carving. Never carve when it is slimy to the touch or when the carving residue is in powder form. If the block becomes too dry resoak, this can be repeated as often as one wishes. You can keep the block in a damp cloth for day to day carving. When completed carving, dry the block naturally for a few days. Then surface scratches may be removed with fine 500/600 wet/dry paper. Any cavities may be filled wih superfine indoor polyfiila. Colour effects can be achieved with coloured ink's. Test on sample first to get the desired effect. Place carved block in an oven for 20 minutes at 90 degrees C. then put beeswax in a container and place the container in a pan of water, heat the pan till the wax is liquid. place a small brush 1/4 to 1/2 inch in the wax. Remove the carving from the oven and the pan fom the hob brush the wax into the carving till it absorbs no more. Repeat this waxing / heating process until the carving has an even coating, place in oven to finish the waxing process then remove and allow to cool." There is a process called calcining which makes the meershaum very hard but I have no information on that. From my pottery days, I remember that calcining meant firing a powdered material, such as kaolin, and heating it up to a certain temperature. Calcined Kaolin shrinks less when added to a clay or glaze than ordinary kaolin would. I calcined clay body dry mix, then added a touch of clay slurry to the calcined mix, to dab into small holes or cracks. It sometimes worked, and sometimes not when firing the pots to the high temperature. So my guess for meershaum is that to calcine would mean to heat the material to a certain temperature to drive off the chemically bound water and to begin the melting process to harden the piece of material. Just my guess here. I havn't carved any yet but intend to shortly. I reserched the subject and here is what I found. References are from the internet. Bradley W 1930-meerschaum beds in the greenriver formation of colorado, Wyoming, and Utah U S Geologic survey paper # 158 Next Bush & Faris. V. 1915- Meerschaum Deposits in New Mexico detail in Mining Journal # 99,941 next- Michel H. 1913, Coloidal chemistry of New Mexico meerschaum also --1914 Meerschaum in Grants Co. New Mexico...Koloid. Zeits. 14-146 Next Starretts Douglas B.--1907 Meerschaum in New Mexicovia U S Geologic survey Bulletin # 340, 466. This is from references in other literature. Places of known deposits-- Yavapai Co. Arizona, Chester Co. Pa. Inyo California Durago Mexico Dorsey Mine, in Bears Creek Canyon NM. Also Bears Mountain NM. Also Producing mine in Little Cottonwood Utah. I hope this is of some use to somebody. I am going to grants NM. to check on the possibility of getting some there. John.B. I've also run across references to a mine in Montana. I've heard that the MT material is coarser than Turkish, however. I feel compelled to post on this tread as it is what brought me to this forum in the first place. When i was 14 years old i lived in a very small ranching town in southern New Mexico, right near the Arizona border. Our property bordered on National Forest Land. Nearly every day my father and I would hike into the hills, exploring the ridges and gullies looking for interesting materials such as stone, antler, and manzanita burls, etc. We came across a 10 foot + thick band of Meerschaum that seemed to go on for miles. It was very pure white and evenly textured like the Turkish material, with some very interesting dendritic inclusions of black manganese. Rather than large nodules of material surrounded by clay as I have seen in turkish Meerschaum mining videos, it was a massive outcropping where you could literally quarry giant blocks of the stone. My father who had a tremendous grasp of geology and mineralogy identified it immediately and we took home some chunks to carve. I did not know about the wet-carving technique, or wax treatment, but we made some interesting pieces nonetheless. It carved splendidly with a pocket knife or using blocks of sandstone to abrade it. there were even chunks where a forrest fire had hardened the stone and turned it a burnt orange color such as you would see in a well cured Meerschaum pipe. After doing some research i learned that the only known commercial source in the states was only a hundred miles away from our location, so it must have been the same rock strata. Sadly, i never took pictures and all the pieces wound up as gifts to family or friends, so I cant post pictures. We moved away not long afterwords and I have not been back since. It has stuck in the back of my mind though and when i have transportation again i intend to make the 1000 mile roadtrip to collect some. When I do i intend to file a mineral claim and quarry some for distribution....... i believe it would take care of any import/export woes that carvers contend with regarding Turkey. my hands are twitching and i am salivating somewhat just thinking about a big creamy white block of it !! Ihave done one carving and have found that it is difficult to get more rough meerschaum. It would be great if it could be purchased from the states to good luck with your claim!